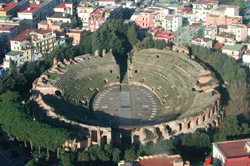 Pozzuoli began as the Greek colony of Dicaearchia. The Roman colony was established in 194 BC, and took the name Puteoli from the Latin putere (to stink), referring to the sulfuric smell in the area, most notably from Solfatara. This is because Pozzuoli lies in the center of the Campi Flegrei, a caldera. Puteoli was the great emporium for the Alexandrian grain ships, and other ships from all over the Roman world. It also was the main hub for goods exported from Campania, including blown glass, mosaics, wrought iron, and marble. The Roman naval base at nearby Misenum housed the largest naval fleet in the ancient world. It was also the site of the Roman Dictator Sulla's country villa and the place where he died in 78 BC. The local volcanic sand, pozzolana formed the basis for the first effective concrete, as it reacted chemically with water. Instead of just evaporating slowly off, the water would turn this sand/lime mix into a mortar strong enough to bind lumps of aggregate into a load-bearing unit. This made possible the cupola of the Pantheon, the first real dome.